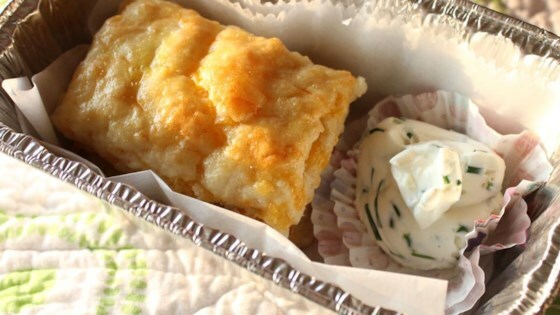 "Chives are the first herb to come up in the spring, and their delicate flavor pairs well with these biscuits. A little bit of Parmesan cheese makes the flavor of Cheddar cheese really pop; try it next time you make mac and cheese!" Beat softened butter, chives, and cayenne pepper together in a bowl until well-combined and smooth. Stir flour, baking powder, baking soda, and salt together in a bowl. Cut cold butter into flour mixture with a pastry blender or two knives until mixture resembles oatmeal. Add Cheddar cheese and Parmesan cheese; toss to coat. Stir buttermilk into flour mixture until dough is just-moistened. Turn dough out onto a floured work surface and gently knead until dough comes together, about 6 to 8 times. Roll dough into a 9-inch square (1/2 inch thick) with a floured rolling pin. Cut dough lengthwise into 4 strips and crosswise into 6 strips. Place biscuits on a baking sheet and brush tops with beaten egg. Bake biscuits in the preheated oven until golden, about 15 minutes. Transfer to a rack and cool until warm, at least 15 minutes. Serve with chive butter. You can substitute hot sauce for the cayenne pepper, if desired. Chive butter can be made 2 days ahead and kept chilled, covered. Bring to room temperature before using. These are so delicious! I would recommend adding slightly more salt to the butter.